Last weekend I ran my first wargame for the public. 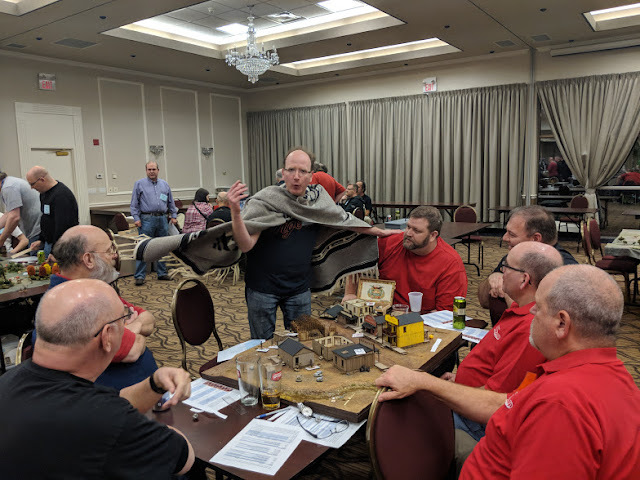 I was attending Hot Lead (Canada's finest miniature wargame convention), and decided at the last minute to put on a game because I heard that they were a little thin on the first night of festivities. The game on Friday went so well that I was asked to put on the "staff game" for Saturday evening. This is an off-menu game that the guys who run Hot Lead play together once the heavy lifting of the conference is over. By custom, it's a pretty raucous affair, with plenty of drink, trash-talk and drink. For me, this was a big honour. 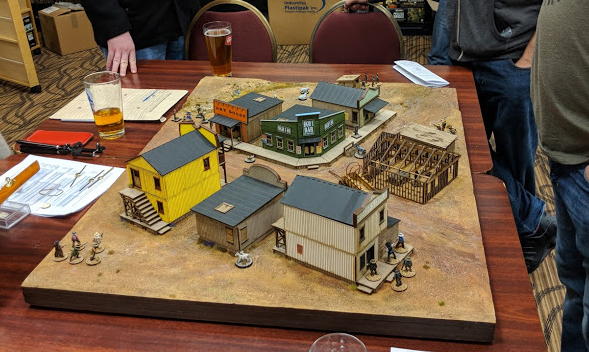 The game I ran was a heavily modified game of Dead Man's Hand using the small battle-board I created to represent the Old West town of Cremation. 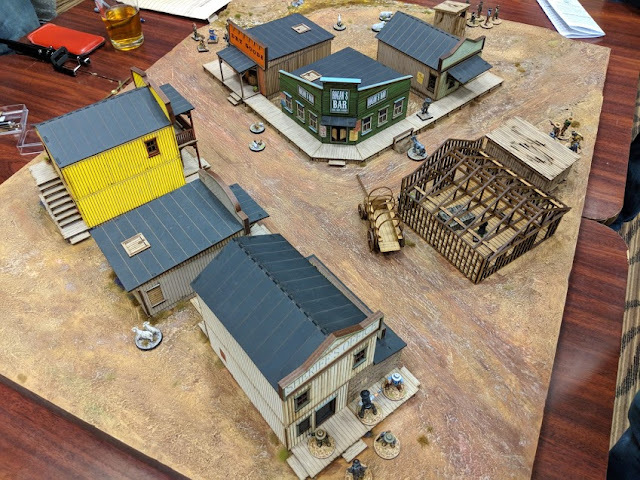 I called the scenario "The Good, the Bad and the Stubbly." I had to simplify the rules of Dead Man's Hand so that it would be easier to learn and more suitable for 5 or 6 players. The way I designed the game, each player would control a gang of five miniatures, including one boss and one sharp-shooting lieutenant. The rules modification that I'm most proud of was the system I devised for activation. The original version of DMH uses playing cards to activate individual miniatures, with higher ranking cards activating miniatures first. I liked this system because the playing cards accentuate the Wild West flavour. But I wanted to take it even further. So, I created a new system where the players don't get dealt a random hand of cards with which to activate all of their miniatures. Rather, in my version, the players have to earn their activation cards. They do this by playing a quick game of Blackjack at the start of each turn. Each card they are dealt in the Blackjack game is then used to activate one figure. If a player goes bust in the Blackjack round (i.e. goes over 21), then they lose the card that busted them, plus their lowest other card. If a player hits Blackjack itself (i.e. hits exactly 21) then as a reward they gain an extra card in addition to all the ones that helped them win. This Blackjack modification worked splendidly. It was quick, and added a spicy element of risk to the simple matter of initiative. 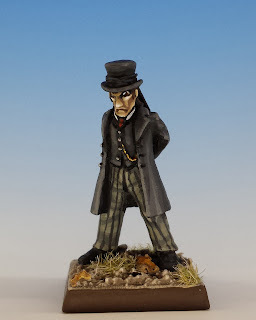 A player was assured of activating two of his five miniatures if he played conservatively. But if a player was dealt (let's say) a King-of-Diamonds and a Two-of-Spades, he could gamble for a third activation at risk of busting out. Another advantage of this initiative system is that it contains internal balancing mechanisms. A player might get all five activations if he was dealt a large number of low cards. 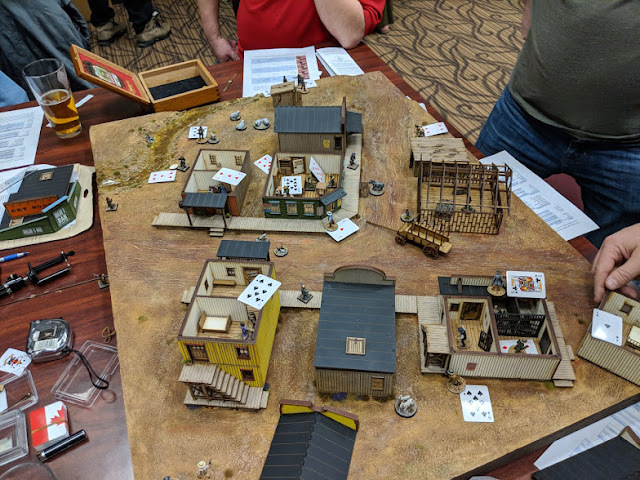 Although that's good in terms of mobilizing your men, it's bad because all these men are moving late in the round, and DMH is a game where a low initiative is a deadly disadvantage (aka, you're slow on the draw). On the other hand, characters with just two cards will usually be going earlier in the round. 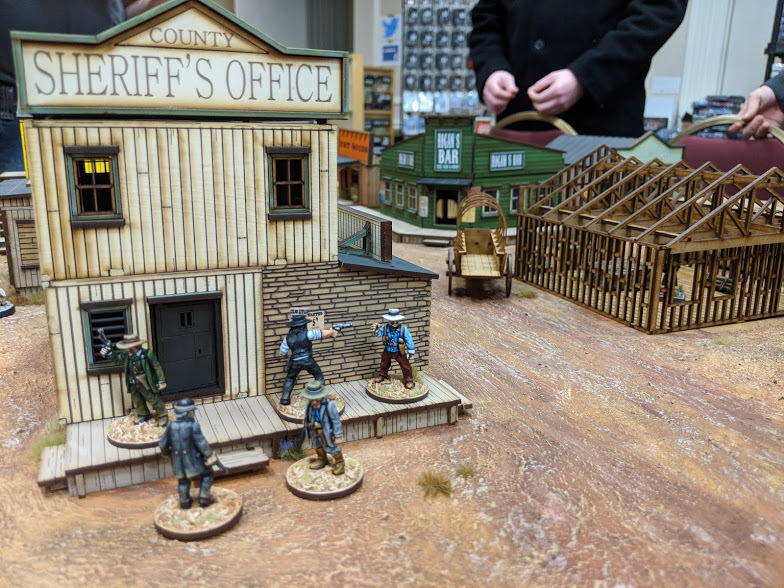 The basic scenario is that the sheriff of Cremation, Daniel "Dapper Dan" Alabama has captured the infamous crime-lord Rector Riggles, and is holding him in a cell in his office. One player manages Dapper Dan and his deputies. 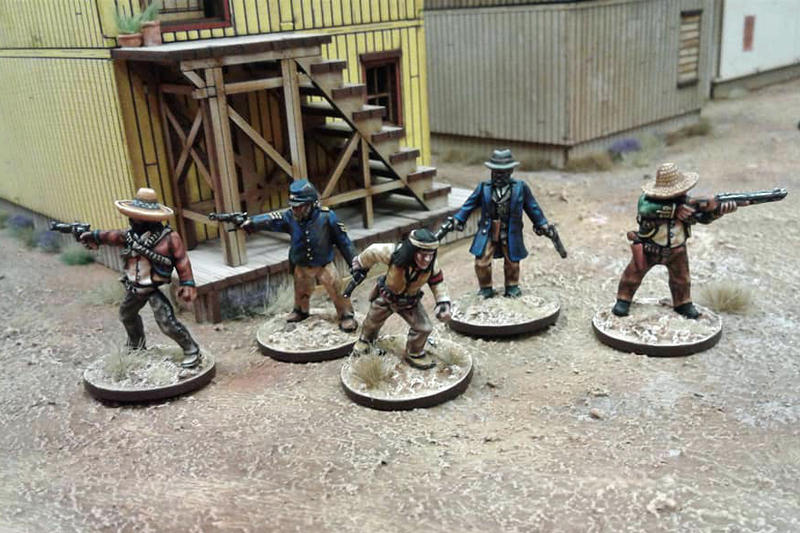 The other four players control the four outlaw bands who used to work for Rector. They converge on the town but have a lot of options for what to do when they get there: free Rector? kill him? Rob the bank? Terrorize the citizenry? Visit the cat-house? Shoot each other? I don't want to sound crazy, but I've heard tell that there's a mule in town who can talk. A real live talking mule, just like they have in Yerup! Otis' boy told me that the mule was real smart. The staff game on Saturday night was a riot. The outlaws largely ignored Dapper Dan and his captive, instead opting for senseless internecine feuding. Nuns were shot, mules were interrogated, banks robbed and buried treasure discovered. One deputy made a daring run across a corpse-strewn street in order to get Dapper Dan a can of that hair pomade that he likes so much. Even Dr. Friendly got a corpse for his medical experiments. 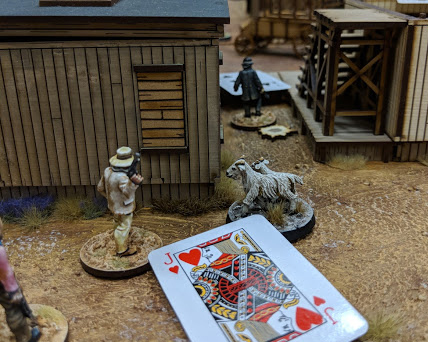 When the dust settled, the winner was James, who is the proprietor of the wargaming blog Rabbits in my Basement and the Chairman of Hot Lead. The Game Master hams it up for the players. Cremation before the carnage starts. A table full of activation cards! Bad Bart tries to kill some goats (?) because a talking mule (??) promised him 3 wishes (???). The winning team: Diego's Desperados! A big thanks to the Hot Lead team! My appreciation goes to all the players, and especially to my play-testers (Stephen, Matthew O., David, Peter, and Travis) who greatly helped me to refine the game for public consumption, and Konrad for moral support. 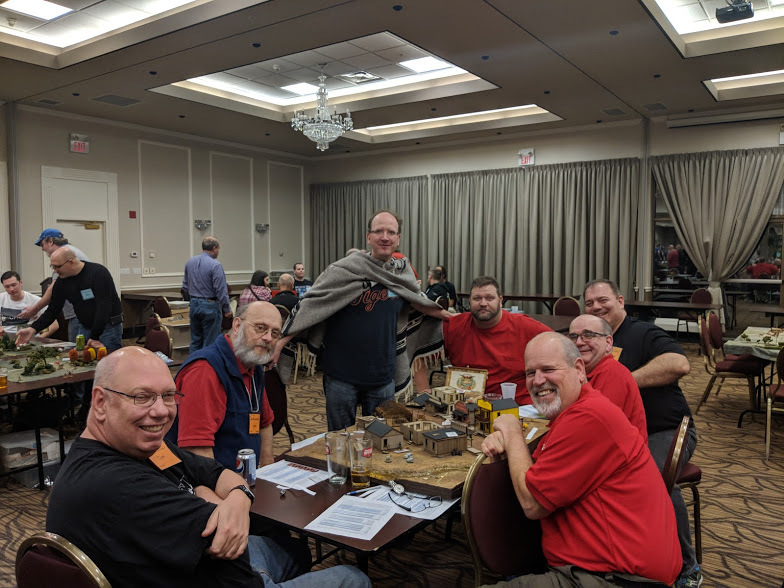 And check out some of the other write-ups about Hot Lead from some friends of Oldenhammer-in-Toronto, including posts by James and Hot Dice Miniatures. I'm not sure it was half as chaotic as some of your games, but we all need something to aspire to. What a great show! Love it! Hot Lead is always a good time. Thanks Suber. By the way, I will just say again that I love your new Don Quixote model. Looks like great fun - makes me want to break out a couple of Black Scorpion outlaws instead of the 120 Moria Goblins I’d planned on starting to batch paint. Very envious of the poncho - as a teenager watching Clint Eastwood, I’d always hankered after one. It's a poncho? I thought he'd nabbed the blanket off the old downstairs couch without the missus finding out. In fact, the poncho is a good-natured bone of contention between Ms. Oldhammer-in-Toronto and myself. She often wants to wear it outside, while I like to keep it in reserve for special occasions. I guess I'm secretly jealous because I know it looks much better on her. Thanks for putting up with us and our drunken shennanigans. The pleasure was all mine. Good luck with your gangsters! Next year, I swear! Great looking game! I hope you can make it next year, Christopher. You tried to explain it, but there is no way anyone grasps the magic that is Cremation. I'm stealing the spirit and putting my own thing together. You've really cracked a code here! Thank you again for playtesting! That looks like hella fun, and those wild West models are excellent, especially the creepy Rector Riggles! 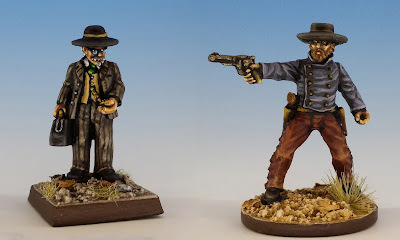 Yes, Rector is one of Foundry's excellent old west civilians. Matthew great post. Where did you get/who makes the buildings? Wonderful game Matthew! It was so fun to play and your adaptations of the rules were masterful! Well thanks again for inspiring me with that fantastic Chinese-dock-brawl game you ran a few years ago. Holy heck that looks and sounds like a super fun time. And it looks amazing to boot! Bravo for being brave enough and savvy enough to run yer own game too. It took me quite a few years to build up the gumption, but it was finally worth it! Lol @ "senseless internecine feuding"... I can totally imagine how that went down :D Sorry to hear about the nun, I guess you don't see many nuns in the old west for similar reasons. Yes, nuns are like the buffalo: once they roamed the plains in vast herds, but over-hunting has rendered them nearly extinct. I don't have enough miniatures for 6 players but I'd like to try. Sounds like a blast. Beautiful looking table.